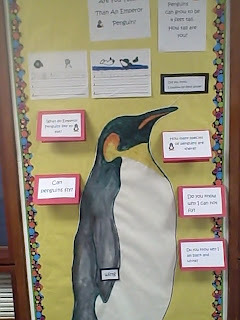 We had a busy week finishing up our penguin activities. The kiddo's wrote their own books and helped create this interactive bulletin board for the hall. As I stood on a chair after school trying to reach high enough to trace a 4 foot penguin I wondered if I should have just measured the kids with a yard stick....but, I really think it turned out great. Painted it with water colors and VOILA..."life" sized emperor penguin. 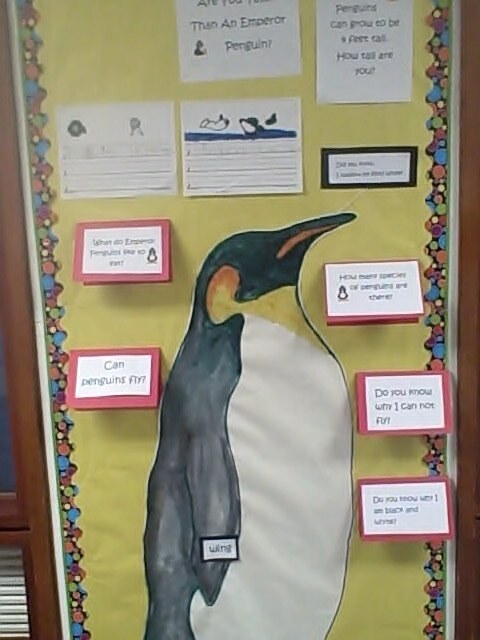 Surrounding the penguin are questions and facts about penguins. Thanks for following me. I am following you too now!! I love your blog! They will love the penguin! and I think I would be terrified if I ever saw a real life emperor penguin! Your penguin looks awesome - definitely worth the hard work. I have an award for you on my blog. Come by and check it out!